We are the Best Roofing Contractor Services in all over tamilnadu & south india. Our company has earned accolades in offering open terrace Roofing to the clients. A Roofing work Team of trained professionals and qualified technicians offer these services with the use of the most advancedtechnologiesand modern equipment. these Roofing services rendered after understanding the requirements of the clients. This Metal Roofing Shed is manufactured as per the standard of industry using supreme class material under the supervision of skilled professionals. Additionally, this service is widely admired in the market for their timely completion. All these factory sheds are in great demand among our esteemed clients for their longer life span, rugged construction and perfect finishing. We are engaged in offering Auditorium Shed. 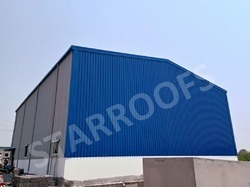 This Auditorium Shed is accessible in different sizes & other related specifications as per the demands of the customers.Our given Auditorium Shed is designed with precision using best in quality material & modern techniques keeping in mind the set norms of industry. With involvement of high-end technology, modern machinery and advanced tools in all our processes, we are offering Auditorium Roofing Shed. The shade provided by us is extensively demanded in auditorium for providing high level of safety against adverse weather condition. Our given auditorium shed is designed with precision using best in quality material & modern techniques keeping in mind the set norms of industry. We offer this auditorium shed at affordable price to our valuable clients.